WinGo is a printer specializing in board games in Huizhou, China. 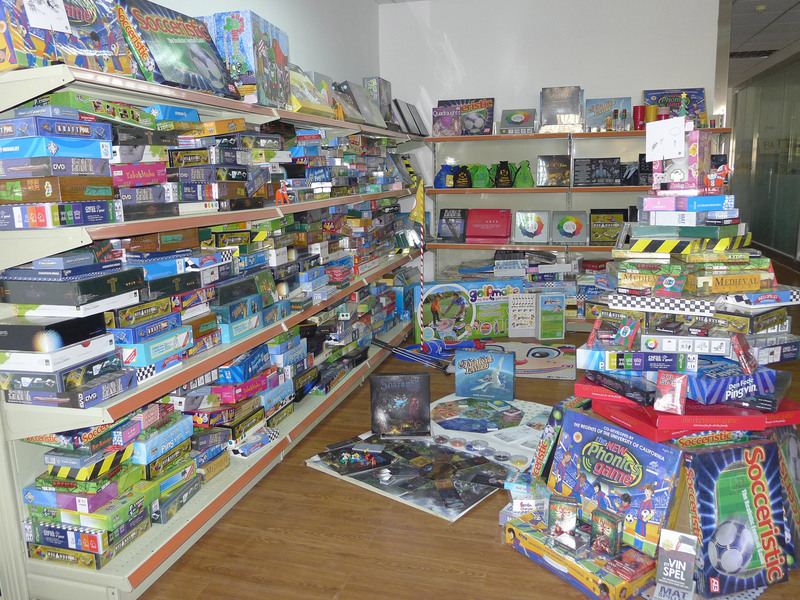 Starting as a general printing company in 1992, they transitioned to a board game focus in 2003. The company is headed by Leon. He works alongside a half dozen graphic designers and businessfolk in the corporate offices, tidying up game graphics for printing and making sure the numbers work. The location of this building gives WinGo one of its advantages that Leon is happy to sell to customers: Lodged in an office building otherwise full of import-export firms, WinGo has an easier time than most slipping a dozen games onto a pallet to here or there without paying an arm and a leg for the privilege. If you want to ship just a few games to Europe, just a few to Australia, and so on when your print run is done, WinGo has stronger connections than most to make the economics of small-batch shipping less painful than it would otherwise be. 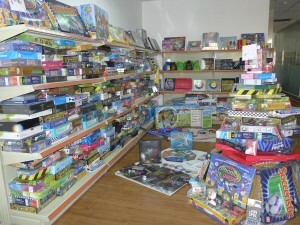 Finished games in WinGo’s showroom. Across town, the magic happens in a two story factory building. On the first floor big-box printing happens: Packaging for large screen TVs and the like. Most of this part isn’t game printing, but the die cutters live here, as do some of the card finishing machines. Heading up to the second floor, we saw the serious business of game making: The offset printer, boxworks, lamination machines, and the wing of hand-work tables. The games WinGo was working on while I was there were card-heavy, so I took the chance to document the card creation process while it was all laid out between a couple different games. Cards start their life as poster-sized sheets of cardstock, (i.e. extra-heavy paper) that goes through an offset printer the same as labels and rulebooks. It gets printed on both sides. With a typical sized sheet and typical sized cards, you can fit two poker decks worth of cards to a sheet: 10 columns by 11 rows. A couple slots may be set aside for printer’s guides, for something like 108 cards to the sheet at the end of the day. 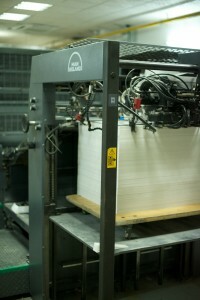 A stack of cardstock at the head of the offset printer. Each of these sheets will be printed both sides, and then cut into a 108-card deck. If the cards are going to receive a special finish, like a linen finish or poker-oil coating, this happens while they’re still in uncut sheets. Giving card sheets a poker-oil finish, which increases their gloss and helps them slide over each other smoothly during play. If cards are being made by double cutting, which is what most non-card-specialists have the tools to do in-house, the sheet of cardstock then gets sliced into strips and rows. Still held into sheets by uncut tabs, the cardstock sheets are separated into strips then piles by a worker, by hand. 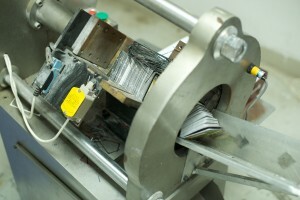 The piled up stacks of cards, still square-cornered and larger than the final size, are loaded onto a double-cutter. Here they get pushed through a hefty bladed window that lets only of the center of the card through. 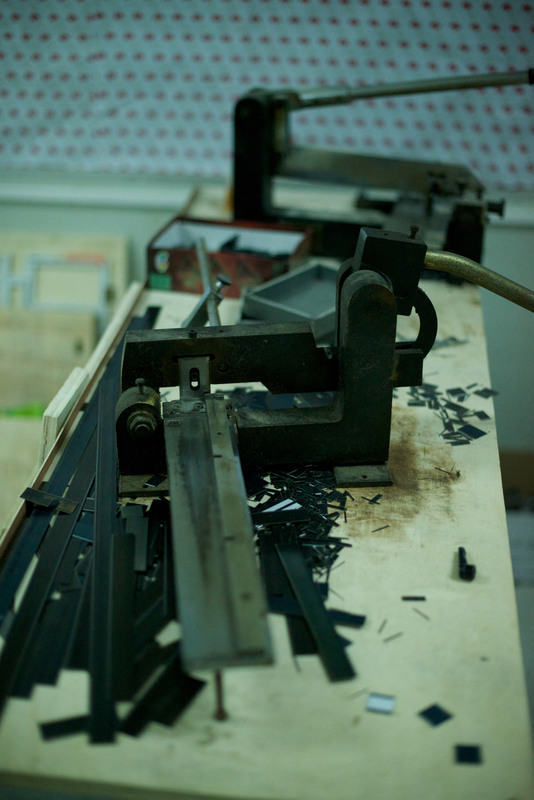 The outer border of the card is left behind on the other side of the double cutter, where a second blade cuts it in half so it can fall away or be scooped out by the worker running the press. Finished cards emerging through the window of the double-cutter. Another step of the process WinGo showed me in more detail than I’d seen previously was the die-(cut)-tooling. 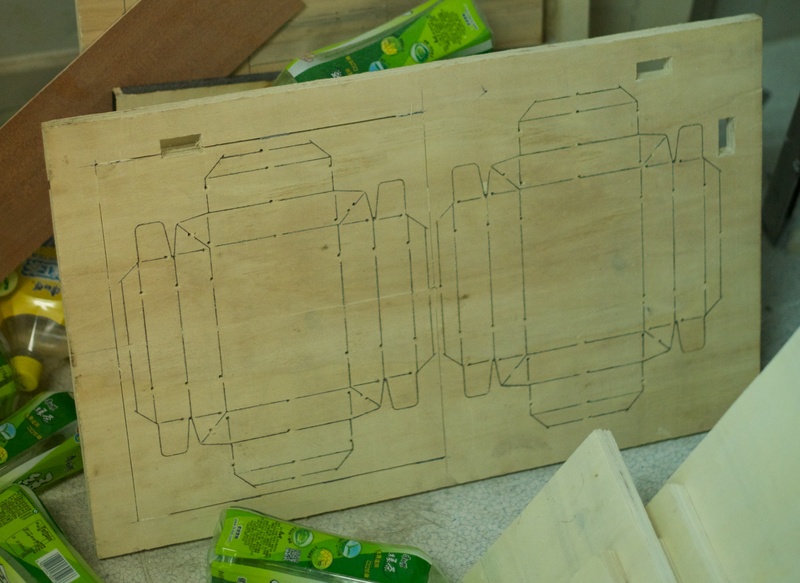 Off to one side of the factory, WinGo had a die-cutting workshop, were a single engineer stood in meditation over a print plan, figuring out how he was going to tackle this one. He didn’t seem to mind as I swept around the room, grabbing photos of each step of the die-tooling process. 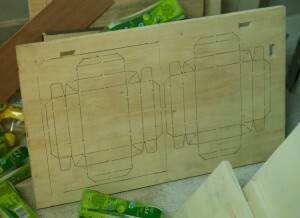 The board that the die blades will be fitted into. This one is set up to make all the cuts and scores that will prep a sheet to be folded up into a pair of box lids. 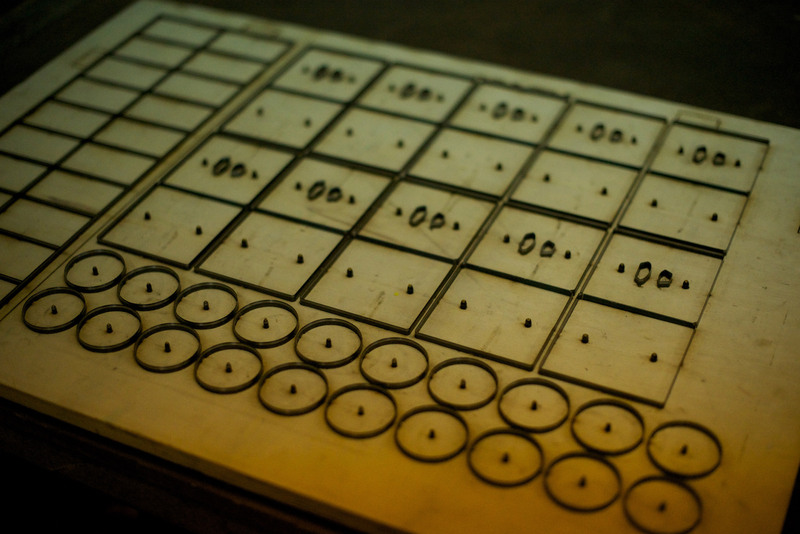 The die blades are clipped from long strips down to the precise length needed to go into the board. 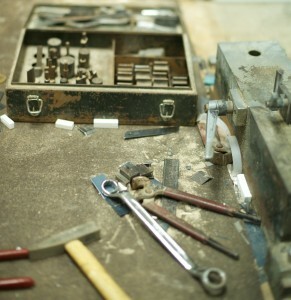 Hand tools are used to bend the die blades into shape for the boards. 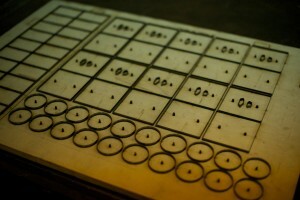 One finished die, with all blades installed in the board. Padding will be installed around the blades to keep the cut parts from lodging in the die, but otherwise this one’s ready to get installed in a die-press and start stamping out punchboards for someone’s game. WinGo’s offering to take over more of the work of game distribution, getting small batches of your game to remote corners of the world bears exploration. Kickstarter has opened the need to get small batches out of a printing to remote locations in the world, and WinGo wants you to know they can help with that. Back at the corporate offices I saw WinGo graphic designers doing parts layout pre-press for customers. If you’d rather be hands-off in how your punchboards and parts fit together, WinGo has demonstrated a willingness to take this part of the work off your hands. One thing that publishers stressed when I was going into these tours was that they wanted to hear about game drying and curing. Did this factory or that factory have a drying room? There are persistent horror stories running around among publishers whose products warp after printing. More grisly are the tales of whole batches of moldy games after the floods a few years back. So I had to grill Leon a bit when he said that he didn’t have a drying room. At all. Didn’t need one. Leon insists that game warping isn’t about drying and curing, it’s about the quality of your greyboard stock and your glue selection when laminating the labels onto the boards. Regarding our corporate offices. It’s for not easily in touch with shipping company only. Firstly, this head office ( including marketing, showroom, Quality inspection, product development, art design) can work independently. It’s a help for management including quality control. 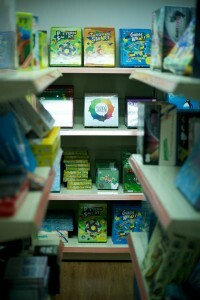 independent of office can driving our team focusing on board game development & production etc all around the board game. And it’s providing by local government free of charge. 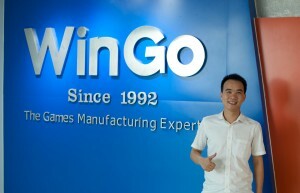 They are encourage company like WinGo to doing well business on their scope then can pay more tax. Sorry for misunderstand on this point! Regarding game component drying. Sorry for confused here. That material quality & glue are very important to keep the playing board or other component won’t warping / moldy. But I have mentioned all gray board material from raw-material supplier was dry up before delivery to WinGo. The raw-material supplier’s drying room & equipment are more professional than a simple drying room with some heaters inside. And then WinGo just cut it and laminating the surface printed paper on outside of the gray board. 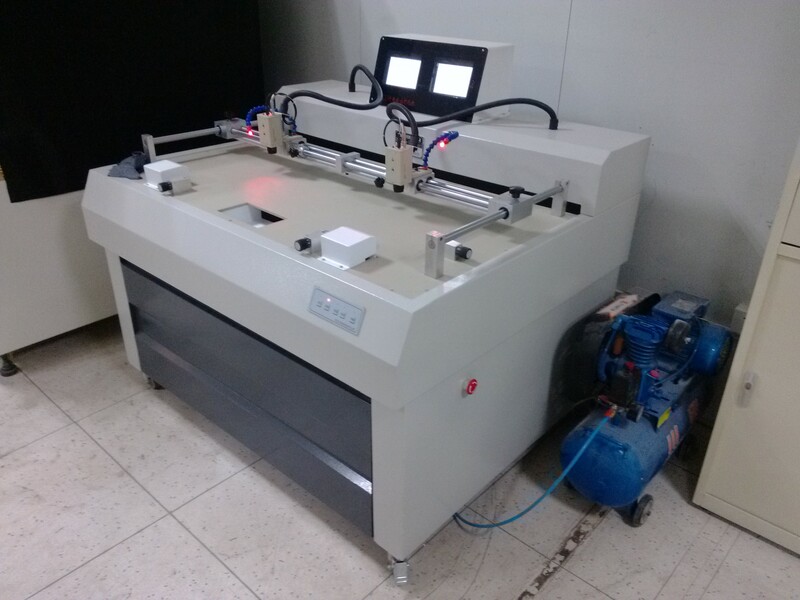 This technology are more reliable than final component put into drying room then keep 7-12days. It will have other chemical reaction appear. We used same method before but this is not scientific method. I guess we had delivered more than two million games to global market. So far, this problem are under control! Leon also noted that he hadn’t shown the Computer to Plate printing during the tour, and provided the photos below, of that part of the factory. 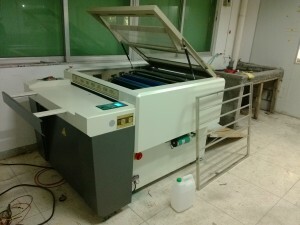 Step 1 of Computer to Plate printing, the plate printer itself. 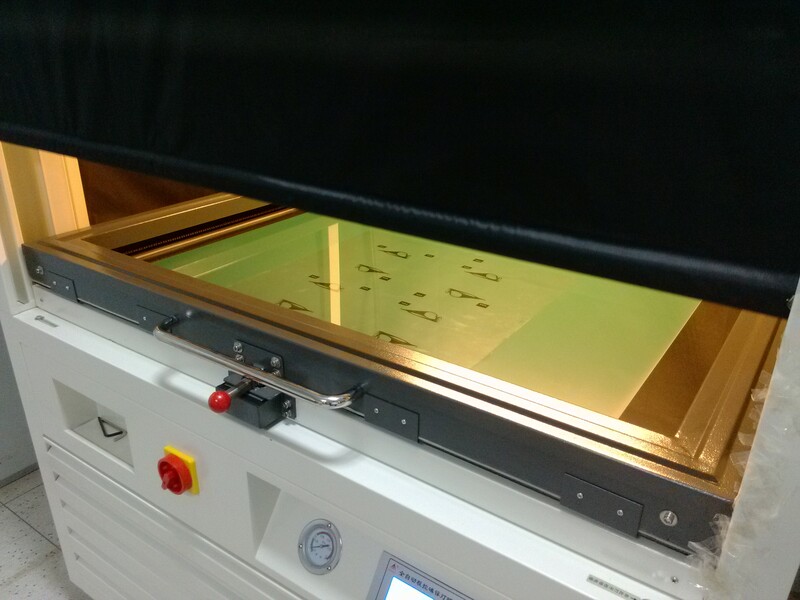 Step 2 of CTP printing: The Rinse & Dry machine. 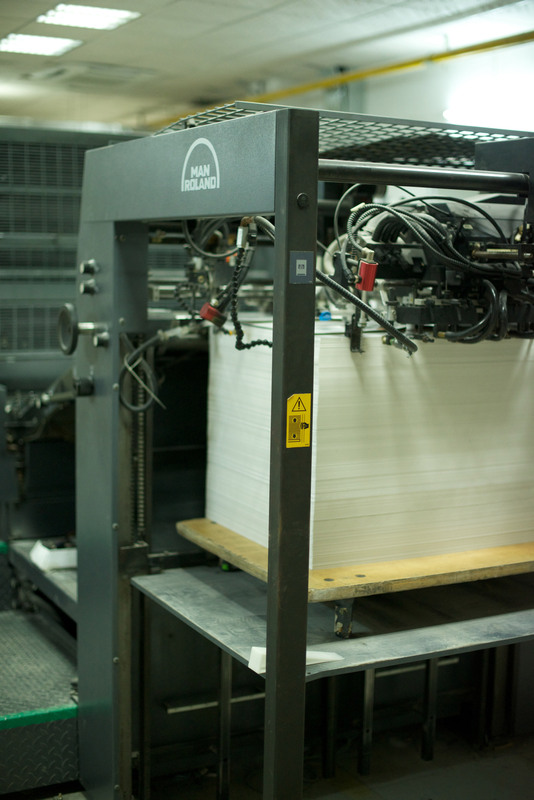 Step 3 of CTP printing: Punching the plates with mounting holds to hold them in place during printing. Leon also requested that this picture of his showroom be included. P.S. Looking for a job? 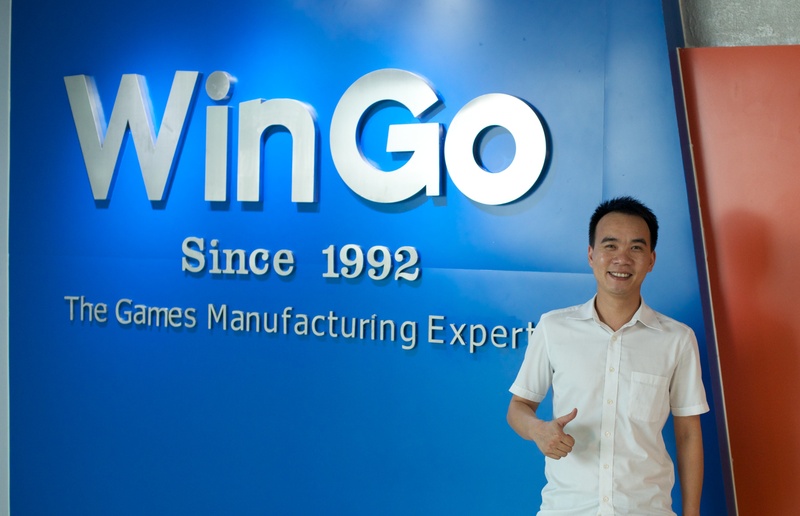 Like most Chinese printers I toured, WinGo had ambition to overtake Panda. Leon had identified North American & native English representation as one of the keys to Panda’s success, and he’s looking for a U.S.-based representative for his company now. This entry was posted on Wednesday, August 14th, 2013 at 9:29 amand is filed under . You can follow any responses to this entry through the RSS 2.0 feed. You can leave a response, or trackback from your own site.